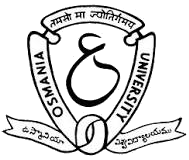 The Directorate of Admissions, OU was established by the University in year 2000 with an aim to streamline the process of admissions to various courses offered by the university. The objective of introducing centralized admission is to conducts admissions in a systematic, transparent and student friendly manner. It is in these lines that the Directorate has been carrying out the task of admission process offered by the University and its affiliating institutions since 2000-2001 academic year. Besides, this office is also carrying out the process of admissions into various courses offered by Telangana, Mahatma Gandhi , Palamuru and Potti Sreeramulu Telugu Universities since their inception. The Office of the Directorate of admissions is headed by Director and Supported by the joint Directors along with other Supporting Staff. Issue of Notifications: The Director of admissions issues notification for entrance and admissions into various P.G., P.G. Diploma and 5 Yrs. Integrated Programs generally during the first week of April every year. The notifications for other courses such as MBA(Evening ) Courses , Healthcare Diploma courses, Ph.D Eligibility Tests, Special Education Courses, MDHM, B.Ed. (Distance Mode), etc. will be issued as and when the University notifies them. Entrance examinations:Conducts entrance examinations to various P.G. and P.G. Diploma and 5 yrs. Integrated Programs in first/Second week of June and after evaluation declare the results along with a rank wise list. Counseling: Admissions to P.G., P.G. diploma and 5 yrs. Integrated Courses offered by various University Constituent and affiliated colleges will be made through a centralized counseling process. The counseling process, in general, commences during the last week of June / first week of July every year.